Available in PDF format on this site and in print and Kindle from Amazon. Poor strategic planning and implementation, at all levels, leads to under-achievement of potential, ill-advised initiatives, and avoidable failures. 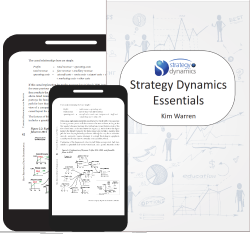 Strategy Dynamics Essentials shows how to solve these problems with rigorous, practical frameworks that anyone can use. The method leads to working, quantified models that support the main aim of strategy - strong, sustainable performance over long periods of time. The book provides access to numerous working examples. The book is intended for executives, analysts, consultants and business students at all levels. Its method works for any enterprise, or any component part, of any scale, in any sector, and at any stage - including before a new venture starts or an expected challenge takes place! It can be used for continued strategic planning or to deal with any issue an enterprise may face. No advanced technical skills are needed to use the method—just the will and ability to think quantitatively about whatever enterprise, function or issue you are concerned about. Even the earliest principles in the book lead to useful insights right from the start.